The height of the upper river fall is 58 feet. Upper Falls is the tallest falls of the four on the Lewis River.Water falls from the overhanging cliff, but the majority of the water gathers in a narrow trough and stair-steps to the pool below. The falls can vary from a solid curtain of pure roar to being isolated in the narrow channel on the left side, leaving the more vertical part of the falls dry. It is difficult to find the trail down to the Upper Falls from Forest Road # 90. It is one and seven tenths miles from the Lower Falls. The trail starts just before you drive over the Quartz Creek Bridge. 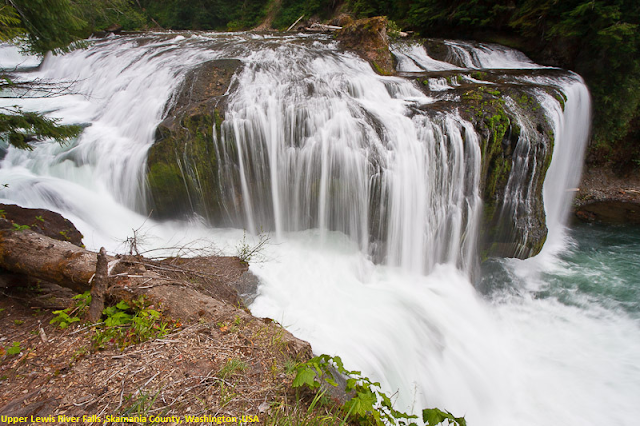 The Upper Falls of the Lewis are found between the Quartz Creek and Middle Falls trailheads along Forest Road 90 near Mount Adams. The falls can be accessed by hiking a little over 3/4 mile upstream from Middle Lewis River Falls (about 1 1/4 miles total from the Middle Falls trailhead - see Middle Lewis River Falls for directions) or by starting at the Quartz Creek Trailhead and following the Lewis River Trail downstream for 3/4 of a mile, passing Taitnapum Falls at the halfway mark. Best access to the pool below the falls is from the north side of Alec Creek where it enters the Lewis River.